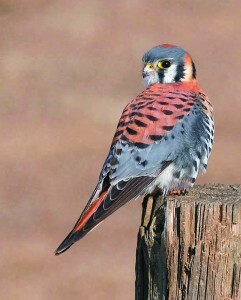 The American kestrel is the smallest falcon of North America and is the only kestrel found in the Western Hemisphere. Even though it has a small body, it is a fierce predator and is usually seen waiting to pounce on its prey in the open country. 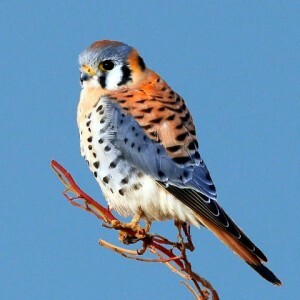 This bird can be easily identified with its distinctive plumage and is very common in rural settings. It is a very colorful bird of prey with the males having blue wings and red tails while the females come in a slightly paler version. 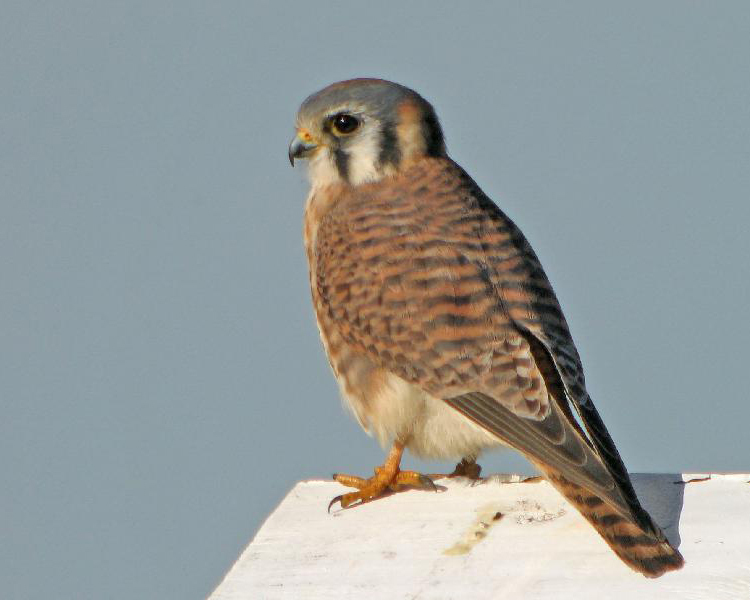 It also has dark eyes and moustache-like marks on the face that is common among most species of falcons. 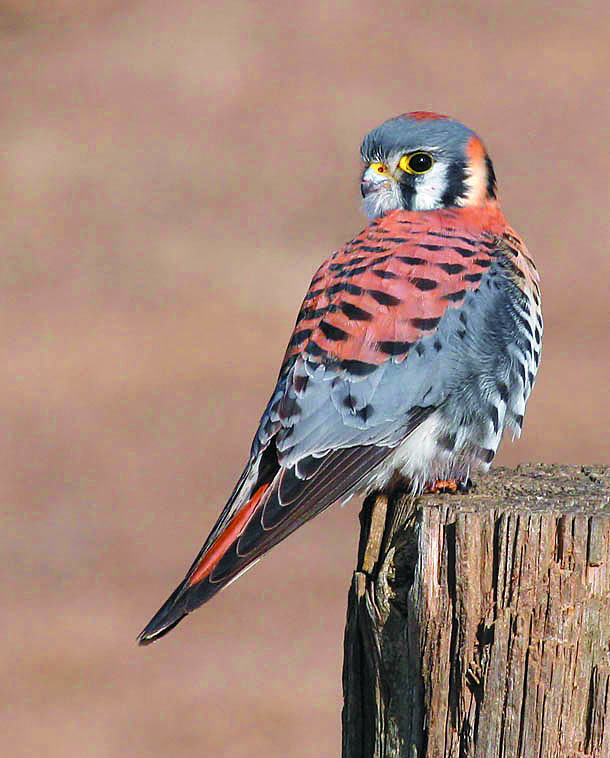 American kestrels are solitary birds and live in pairs only during the breeding season. 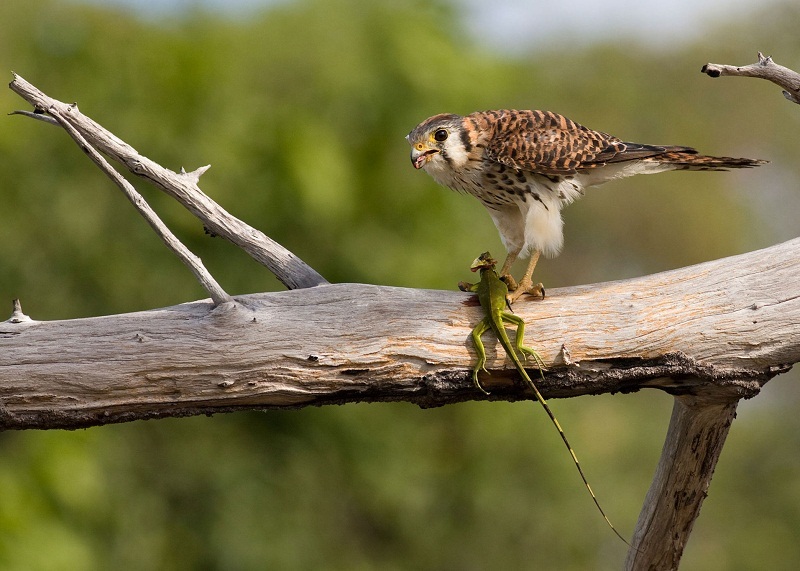 They show aggressive behavior when defending their territory and protecting their nest. 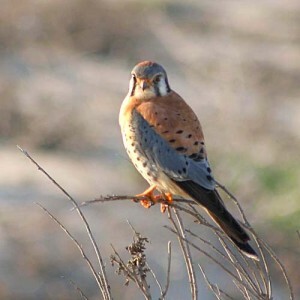 They do this by producing loud calls and pouncing on other birds till one of them is forced to make a quick exit. These falcons bathe in water or in the rain and are also known to take dust baths that remove external parasites from their bodies. 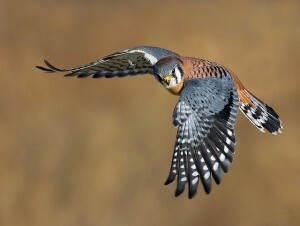 They have the habit of snatching prey from the ground although small birds are often caught in the middle of their flights. 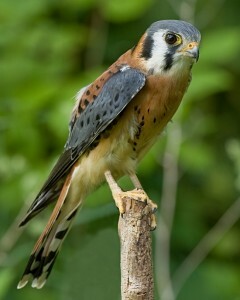 They have an amazing ability to stay balanced in flight and bob their tails while they are perching. American kestrels are monogamous birds and mate with a single partner. 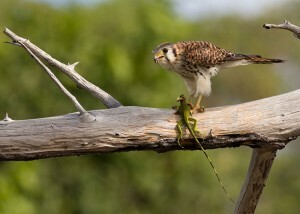 They start with their courtship rituals after they have built a nest. 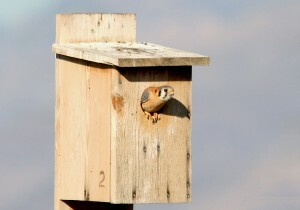 These include a spontaneous display of flight as well as feeding each other. The pair develops a strong and permanent bond for their partners, and they go back to the same nesting sites year after year. 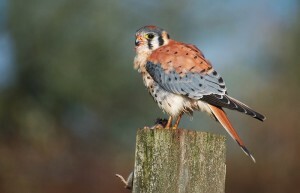 The breeding season of American kestrels is during the seasons of spring and summer. The couples scout for nesting sites and usually the male selects the best site. 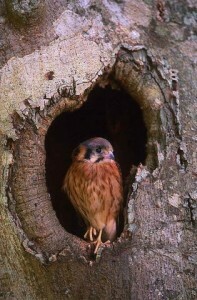 These birds are unable to excavate cavities in the trunks of trees and depend on woodpeckers to do it for them. They also use holes in buildings, crevices in rocks, telephone poles, fence posts and nesting boxes provided by humans to raise their broods. 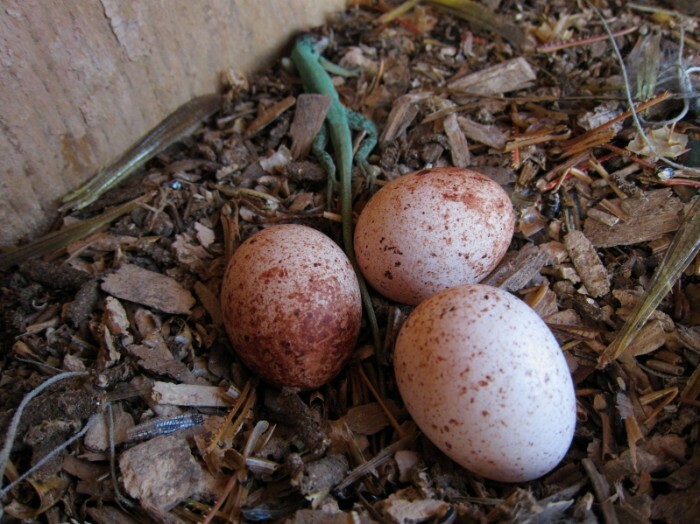 They usually lay a clutch of 3 to 7 eggs and look after a single brood of hatchlings with a maximum of two broods per breeding season in case of the failure of the first one. The eggs are incubated for a month. The chicks are ready to fledge after about 4 weeks of hatching, and the juveniles leave the nest three weeks after fledging. The females incubate the eggs with the males also taking part in the absence of the female. The males do the hunting and provide food for the mother and the babies during this crucial juncture. The females defend their babies and stay in the nest till the time that the hatchlings become independent. The juvenile birds become ready to breed upon completion of one year of age. American kestrels are endowed with sharp beaks and talons that help it tear the flesh of animals that it catches. Two black spots called as ocelli are situated on both sides of their orange and white nape. 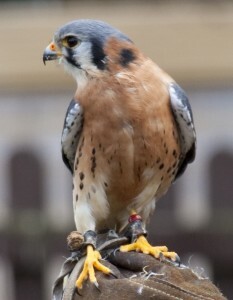 They are believed to function like false eyes, making any potential attacker believe that the bird is aware of their presence and are looking at them. 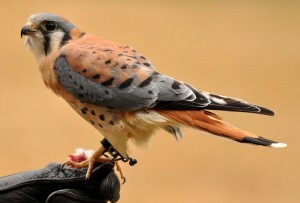 Kestrels have the ability to see ultraviolet light, giving them the chance to see colors that are invisible to humans. 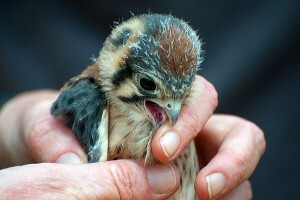 Kestrel chicks eat around double that of the adults and can eat two or three mice in a day. An American kestrel will nest only if it finds a large enough hole in a tree and this restricts their possibilities for reproducing, augmenting their population. Published on August 6th 2015 by admin under Coniferous Forest Animals.